"He Has Sent Hither Swarms Of Code Enforcement Officers"
"He has erected a multitude of New Offices, and sent hither swarms of Officers to harass our people and eat out their substance. He has combined with others to subject us to a jurisdiction foreign to our constitution." Several years ago we wrote: "Every time legislators write a new law, no matter at what level of government, they immediately trigger three very costly events: 1) Increase government employment to analyze, research and study not only the reason or the science to justify the law, but to monitor the effects of the law; 2) Increase government employment to administer or defend the law; and 3) Increase government employment to enforce the law." "Therefore, each new law adds to government employment and government continuously grows, exponentially. Further, many laws can and should trigger a constitutional test but never do. There are tens of thousand, if not millions of laws, that are blatantly unconstitutional. When new laws are challenged, very expensive lawyers get involved on both sides to argue their case before lower courts and then on to a state Supreme or appellate Court and ultimately to the U. S. Supreme Court. In almost all cases the taxpayers pick up the tab, all the result from passing just one more new law." "By just sheer numbers, the more laws that are written, the less likely the entire population will even know about the laws, or understand them, or know of their consequences or penalties for violation, much less be in compliance with them. The consequence of too many laws is that huge segments of the public are totally unaware of their existence. And yet, under the law, ignorance of the law is not a defense. Then, when the hapless individual comes face-to-face with the law, it results in anger and frustration for that individual and a spiraling degradation of freedom and liberty for all of us." "Many laws are written at the insistence of lobbying or special interest groups (corporations - bankers - unions) with very narrow and purposely hidden agendas. Socialists and environmentalists also drive more laws. Social Security, Medicare, Medicaid, Obama Care and welfare are all socialist driven laws. The public never has an opportunity for real input and individual freedom is degraded further. Partisan politics often compromises a new law into meaningless, often conflicting legislation, leaving loopholes over which lawyers can argue over for decades." "But as laws increase, after a certain point, order begins to breakdown under its own weight of trying to comply with often conflicting and confusing codes, ordinances, regulations and acts. And worse, the more laws there are, the more opportunities for emotionally and financially draining lawsuits between aggrieved parties, egged on by lawyers who make their living off of human weaknesses and interpreting laws that no one else can understand." Our focus today is on the explosion of land use and environmental laws. Ever since the passage of the National Environmental Policy Act (NEPA) in 1969, environmental laws have literally exploded. Here are just a few: "The Endangered Species Act, The Salmon Recovery Act, The Clean Water Restoration Act, the Coastal Zone Management Act, The Fisheries Management and Conservation Act, the Winters Doctrine, the Public Trust Doctrine, UN Biospheres and the Wildlands Project, the Boldt Decision, Environmental Protection Agency, the Federal Marine Fisheries Division and on and on. And these are just the federal laws. Now add to those federal laws, millions, and we say millions, of local and state land use and environmental laws. Some of the original environmental laws were passed to clean up hazardous waste sites, but the environmentalists took this one genuine issue and expanded it exponentially to regulate just about every activity on the planet. With the environmentalists and the government pushing man-caused global warming, laws governing CO2 emissions have the potential for breaking the nation's piggy bank, or worse, limiting our energy supplies. States like California, Oregon and Washington have formed a pact to fight "climate change" by taxing CO2 emissions from industry on a problem that is more of a religion, a cult, or a radical agenda, than a science. All those taxes trickle down to the average person's pocket book in one form or another, living costs go higher and the wasted effort will have zero effect on the climate. That is the true definition of insanity. But no one is hit harder by land use and environmental regulations than the rural landowner. Apparently, under the law, the rural landowner must bear almost the entire burden of environmental protection regulations while their city cousins get off almost scot-free. State, county and city legislators pass land use and environmental regulations almost by the day. Then the bureaucracies add more rules and ordinances to the laws legislators pass, along with stiff fines and penalties for violations. To enforce those regulations, government hires code enforcement officers who fan out over the countryside looking for land use or environmental code violations, or answering anonymous complaints from angry landowners who have a grudge against their neighbor. The "neighbor from Hell" syndrome is a complaint we hear often from our readers and our No Trespassing sign customers. Many of these land use and environmental regulations literally destroy the landowner's right of use. But if the right of use is destroyed, then landownership becomes a barren right. What is landownership if not the profits from its use? If landownership becomes a barren right, then no other rights are possible. If these government "TAKINGS" are allowed to stand, the environmentalist's win and the landowner and the constitution lose. "Land, because of its unique nature and the crucial role it plays in human settlements, cannot be treated as an ordinary asset, controlled by individuals and subject to the pressures and inefficiencies of the market. Private land ownership is also a principal instrument of accumulation and concentration of wealth and therefore contributes to social injustice; if unchecked, it may become a major obstacle in the planning and implementation of development schemes. Social justice, urban renewal and development, the provision of decent dwellings-and healthy conditions for the people can only be achieved if land is used in the interests of society as a whole." So what is the beleaguered landowner to do when a federal, state, county, or city code enforcement officer comes on his or her land to inform him or her of a code violation? Or, the landowner receives a notice in the mail telling the landowner that he or she has violated the "code" and the landowner either corrects the violation or faces stiff fines and penalties and maybe even jail time. If you don't move quick enough in Los Angeles County to correct a code violation, the county sends out what they call a "Nuisance Abatement Team." The "Team" is nothing more than a fully armed S.W.A.T Team, complete with SUV tinted windows and AR-15's at the ready. Police state anyone? Since there doesn't seem to be a statute of limitations on land use or environmental code violations, government code enforcement officers can charge the landowner with a violation that might have happened 30 years ago based on current regulations. Either fix it, or else. It doesn't matter how old it is. Most people just roll over and comply with a code violation notice, even if the ordinance, regulation, or law is blatantly unconstitutional, or worse, makes no sense at all. If the landowner tries to fight the violation by appealing it, he or she ends up in a Kangaroo appeals hearing run by the government. The Code Enforcement Officer becomes the witness against the landowner. If the landowner hires a lawyer and goes to court, the lawyer will "burn up" the landowner's savings (and maybe much more) and in most cases leave the landowner penniless and the violation still in force. This usually happens because the landowner is trying to "buck" the system and the system is not only corrupt, it's a stacked deck. There is a defense against code enforcement officers and code violations and the defense actually turns into an offense. The defense/offense is based on property rights and trespass law. What the landowner forgets is that his or her first line of defense is his or her property line. Stop the government from coming on your property to gather "evidence" of a violation and the violation can't be processed. As advocates for rural landowners, our organization has developed a 4-Part Plan to slow down, confuse, inhibit, or stop government in its tracks from filing or processing a violation. 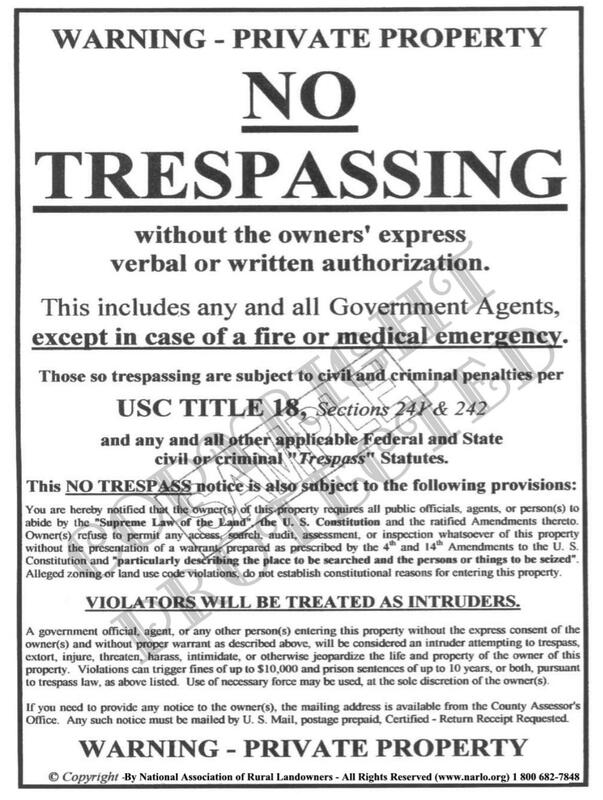 Our No Trespassing sign customers have been using the essential parts of this plan for years. Tell your rural landowner friends or relatives about our plan. They'll want to know. Now if you live in a big city what do you care if rural landowners are getting a raw deal from government? So what? But if government can regulate the Hell out of the rural landowner, what makes you think they can't do it to you? They already are, you just don't know it. Not only that, the rural landowner grows the food you eat. More regulations on the rural landowner means higher costs to the city dweller. It boils down to this. Americans have turned into sheep that buckle under government law and edicts without a whimper or a by your leave. They have been led to believe they have to because after all, we are a nation of laws, aren't we? In our humble beginnings, at the birth of American freedom, we didn't used to be that way when the laws were wrong, or over burdensome. We fought a revolutionary war over government regulation that was much less than we have today. If rural landowners (or even urban dwellers) will not protect their rights, government and their code enforcement officers will run all over them ..... and they are. Either fight, or capitulate. But if you capitulate, you are just a government slave, not a free man or woman. Most of the admonitions contained in the Declaration of Independence have now come back to haunt us. What are Americans doing about it? Almost Nothing! America was and is supposed to be the land of the free and the brave. But now it appears America is just the land of the "I wish I were free" and the slave.